Terence Steven “Steve” McQueen (March 24, 1930 – November 7, 1980) was an American actor. Called “The King of Cool”, his “anti-hero” persona, developed at the height of the counterculture of the 1960s, made him a top box-office draw of the 1960s and 1970s. In 1960, director John Sturges cast McQueen in The Magnificent Seven (1960), in which he played Vin Tanner and co-starred with Yul Brynner, Robert Vaughn, Charles Bronson and James Coburn, and became McQueen’s first major hit. McQueen played the lead in the next big Sturges film, 1963’s The Great Escape, Hollywood’s fictional depiction of the true story of a historical mass escape from a World War II POW camp, Stalag Luft III. After starring in 1965’s The Cincinnati Kid as a poker player, McQueen earned his only Academy Award nomination in 1966 for his role as an engine-room sailor in The Sand Pebbles, in which he stars opposite Candice Bergen and Richard Attenborough. In 1968 he followed his Oscar nomination with Bullitt, one of his best-known films, which co-starred Jacqueline Bisset and Robert Vaughn. 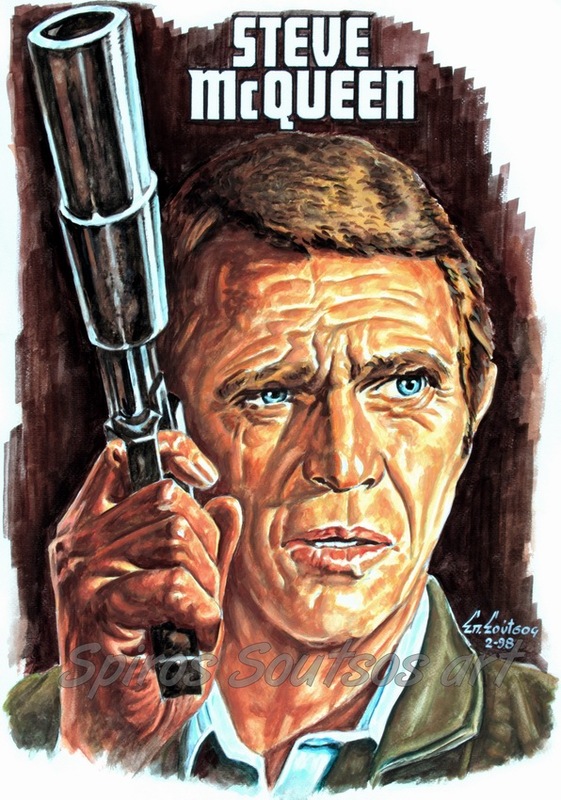 In the same year, after the huge box-office success of Bullitt , McQueen went for a change of image, playing a debonair role as a wealthy executive in The Thomas Crown Affair with Faye Dunaway. In 1971, McQueen starred in the poorly received auto-racing drama Le Mans. Then came Junior Bonner in 1972, a story of an aging rodeo rider. He worked for director Sam Peckinpah again with the leading role in The Getaway, where he met future wife Ali MacGraw. He followed this with a physically demanding role as a Devil’s Island prisoner in 1973’s Papillon, featuring Dustin Hoffman as his character’s tragic sidekick. His last two films were loosely based on true stories: Tom Horn, a Western adventure , and The Hunter, an urban action movie about a modern-day bounty hunter, both released in 1980. McQueen was an avid motorcycle and racecar enthusiast. When he had the opportunity to drive in a movie, he performed many of his own stunts, including some of the car chase in Bullitt and the motorcycle chase in The Great Escape. He became the highest-paid movie star in the world, although he did not act in films again for four years. McQueen was combative with directors and producers, but his popularity placed him in high demand and enabled him to command large salaries.